Fireworks should always be handled with care, they are explosives after all ! However if handled correctly there is no reason you can't have a fun, enjoyable and prefectly safe time using them. There are three types of firework available to the public. Category F1 - Indoor Fireworks. Category F2 - Garden Fireworks. Category F3 - Larger Garden / Display Fireworks. Category F2 Fireworks are designed to be used in smaller gardens and have a minimum safety distance of 8 meters. Category F3 Fireworks are generally larger and you need a minimum of 25 meters safe distance between the fireworks and the spectators. We recommend an ever bigger ditance for some of the larger Category F3 items. This isn't just for safety thought, if you stand too close to larger fireworks you can't appreciate them as well. For an exciting, enjoyable and colourful event you should plan your display in advance. You should nominate one person to be in charge of the fireworks and lighting. If you are having a larger display then individuals should be assigned specific jobs in advance of the event. 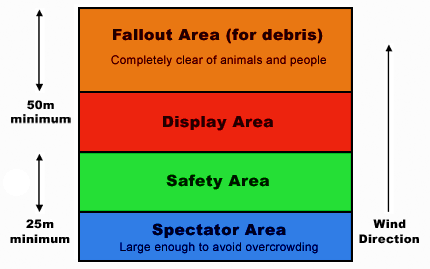 You should organise the area around where the display will take place according to this diagram. Work out a firing script – decide which firework will be let off at which time and in what order and, if a larger display, by whom. Make sure that you read and follow the instruction labels on ALL your fireworks. 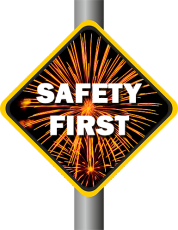 Different fireworks behave differently and need to be set up and secured in differnt ways. Fan style cakes for example must be oriented so the correct side is facing the audience. Make sure you have a torch incase you need to refer to the instructions in the dark during the display. Make sure your firing site can accommodate the type of fireworks you want to fire. Start with noisy effects and cycles of fireworks at ground level, then low level, then effects high in the sky, back to ground level again, ending with a real flourish. Start with set pieces at the front, move onto novelty candles and batteries to high level rockets and shells. By pre-sorting, you can have different effects, colours and noises. Cakes, candles, mines and fountains should be attached to wooden stakes buried into the ground, when doing this make sure that the stake is oriented towards the audience but also angled away from the audience. Attach the firework with strong cloth tape (gaffa tape, not sellotape) or thick cable ties. This will minimise the risk of the firework falling over and facing the crowd. For large cakes use a more than one stake. If its raining you can use plastic bags or bin liners to keep your fireworks dry. Rockets should only be launched from suitable tubes, ensure that the stick of the rocket can rise freely from the pipe. Remember, rockets always travel into the wind so you should take this into account when setting up your display, you should also angle your rockets away from the audience and ensure there is no overhead obstruction such as trees. Set up the display in daylight and practice the firing schedule at least once beforehand. Ensure you have enough timber for static pieces, as some may need to be nailed to stakes. These should be set up in advance of the event and assembled carefully to avoid damaging the firework or fuse. Do not use matches or a lighter to light the fuses, use portfires and have waterproof matches to light the portfires. Do not allow anyone to smoke when handling fireworks or in the firing area when the display is set up. When setting up, follow the instructions as to how far away fireworks should be placed from each other. Put the last firework in place about 30 minutes before the display and ensure the area is well guarded to avoid accidental lighting or sabotage.